I was pretty late to the party on the whole Breaking Bad thing, but having caught up with it last week (after watching constantly every evening) I'm now firmly on the bandwagon, counting the days until the next thrilling installment. 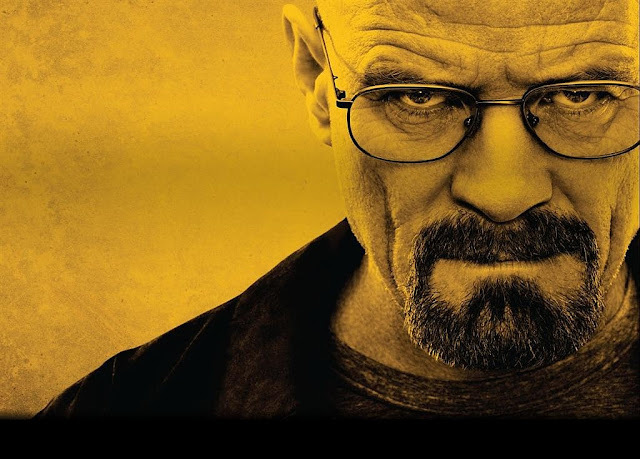 So much of this show is just made by Bryan Cranston who plays the protagonist Walter White. This harangued high school chemistry teacher, already working two jobs to support his growing family, when diagnosed with terminal lung cancer was just so likeable. If anything, he was too nice, letting his wife and family walk all over him. Who can forget them all trying to persuade him to undergo chemotherapy with the awful talking cushion? The fact that he decided to give meth cooking a go, in order to be able to support his family was almost enviable, and definitely understandable. Whether it's cooking up the best meth amphetamine the market has ever seen, or making a home made bomb, Walt provides irrefutable evidence that science is cool and being smart can make you millions. Except for a couple of regrettable moments like when he told Skyler about his second cell phone, or casually leaving Gale's poetry book in the bathroom for Hank to discover (! ), Walt can outsmart almost anyone. It may not be an example we want to show our kids, but it certainly makes for entertaining watching. When we were first introduced to Jesse Pinkman (Aaron Paul) I don't think I imagined how much I would come to like him. Sure, he's young, impulsive and drugged up, but he's also still got a sense of what's right and wrong and he can't kill with the same blasé attitude as another character I could mention. He's done some stupid stuff throughout the series, but he's also been a victim of Walt's brazen ambition. And come on, that cute tufty hair and those blue eyes; what's not to like? Walt has come a long way from season one, and the latest installment of the show had him performing another astonishing feat of manipulation in his 'confession', which brilliantly implicated Hank in all of his criminal activity. While he's unrecognizable from the poor dying man of episodes past, I couldn't help but admire his gall. More subtle still was his ability to convince Junior to stay at home merely by telling him about his chemotherapy. Walt knows how to play people, and it's thrilling to watch. I'm not afraid to say that I totally bought it when he told Jesse he had nothing to do with the poisoning of Brock. Even when they zoomed in on the very plant in Walt's garden which made the poor boy so ill, I couldn't believe he had anything to do with it. And in the most recent episode, as he comforted Jesse and denied 'playing' him, I fell for it, hook, line, and sinker. Perhaps I'm just particularly gullible, but I think this is testimony to Walt's amazing character arc.